Questions on sound were discussed earlier on this site. You can access all posts related sound by clicking on the label ‘sound’ below this post. Today we will discuss a few more multiple choice practice questions on sound, relevant to AP Physics B aspirants. You might have come across questions of the above type under Doppler effect. where λ1 is the new wave length. Or, 7/6 = λ1/0.6 from which λ1 = 0.7 m.
f = (s/2ℓ) √(T/m) where s = 1,2,3,4 etc. For the fundamental mode s = 1. For the 2nd mode (or 1st overtone) s = 2. For the 3rd mode (or 2nd overtone) s = 3 and so on. 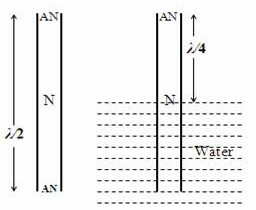 The linear density is mass per unit length and is equal to aρ where ‘a’ is the area of cross section and ρ is the density of the material of the string. (2/2ℓ) √(T/m1) = (1/2ℓ) √(T/m2) where m1 is the linear density of A and m2 is the linear density of B. From mthe above equation it follows that m1 = 4 m2. Since the wires are of the same material, the area of cross section of A must be 4 times that of B.
f1 = v/λ1 where v is the speed of sound in air. (4) A glass tube is open at both ends. The minimum frequency of a tuning fork which vibrates in resonance with the air column in this tube is f. If this tube is held vertically with half its length submerged in water, what will be the minimum frequency of a tuning fork that will vibrate in resonance with the air column in the tube? [Remember that the distance between consecutive anti-nodes (or, consecutive nodes) is equal to λ/2]. L/2 = λ1 /4 where λ1 is the wave length of the resonating sound. In both cases the wave length of the resonating sound is the same. Therefore the resonant frequency is the same as f [Option (c)]. (5) In the above question what will be the minimum frequency of a tuning fork that will vibrate in resonance with the air column in the tube if a quarter of the tube is submerged in water?